They’re the ones who taught you how to ride your bike. They’re the ones that encouraged you to enter the unknown or unfamiliar, to explore, to take risks, to learn, to make new friends. You turn to them first for advice in all things, because they are your parents. The moment you are born, your parents are the first people you likely turn to for everything, but at some point, you are able to do things on your own, or you want to try, and your parents will watch as their little boy or girl grows up and becomes independent. But as you get older, the decisions get bigger, and you may still need mom and dad to help you navigate stuff. Should I go to this college? Should I take this job? Should I move into this apartment? Sometimes people need a little reassurance in the decisions that they make. And at some point you reach a level with your parents where they need you more than you need them. Luckily, they have taught you how to be supportive, how to help them make decisions, so you can pay them back for all that they have taught you. It is the gift of family. But that doesn’t mean you suddenly won’t need them. It doesn’t completely turn the tables. There are still the life experiences you have yet to live that they can guide you through. There’s raising kids, or writing your will, or getting a mortgage. All of the decisions that they have made you can learn from. I know I will always need my parents, just as much as they need me right now. And I plan to learn from them for the rest of their lives, and beyond that, to recount the things they have taught me to my future family. When I was growing up, my father slept with a bat under the bed. When I would come home at night as a teen, or if I woke up to get a glass of milk in the kitchen, he would immediately wake up to check on me. He would call to me and make sure it was me, even though he knew it was. Knowing when I was home put his mind at ease, I guess. But I do wonder…what would he have done with that bat if he thought there was a threat? If the moment came that he had to defend his family, would he? Knowing my father and all that he has sacrificed for me, I think he would do whatever it takes to protect his family — even if it meant violence. I am happy that he never had to go to that extreme to make sure my brother and I were safe, though he did protect us in many other ways. I am certain there were many sleepless nights. Though it does make me think about those trying times, those hardships, those moments when you think that what you are going through is going to kill you for sure — there is no way you can survive this. You can’t see how the situation will make you stronger, as the saying goes. You are pushed beyond your limits and of what you are capable of. It is the reason why it is said, “never say never.” We will always be pushed beyond what we define as our limits. We will always be put into situations that test us and we will always do things we previously thought we would never do. It’s about courage, at the heart of it all. It’s not about being brave. It’s not about not being scared. We all get scared sometimes. Fear is a part of life. Fear helps us protect what matters to us. Every good parent lives with a healthy dose of fear everyday. It’s about confronting the unknown, protecting what matters, and letting go of what doesn’t. It’s about being ready to use that bat if and when the time comes to defend what matters to you. 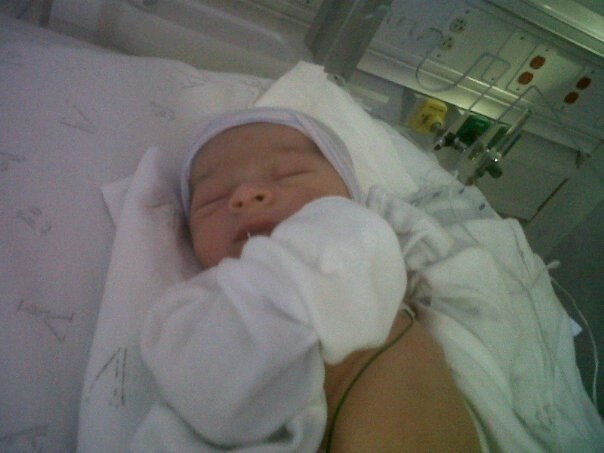 You came into this world on March 13th, 2011 at 1:29 a.m. weighing 7 pounds and six ounces. I first saw you when you were twelve hours old and all I could think was how perfect you are. Ten tiny fingers, ten tiny toes, resting peacefully. You won’t remember the day you were born, but you need to know that you changed a lot of lives on that day. On that day, many people opened their hearts and found more love than they knew they ever had, and it was all for you. To the outside world, you may have looked like a lot of other babies, but I knew better. As soon as I saw you I knew you were an angel. You came here to bring great hope and happiness. You came here to be loved, and to give love in return. You came here to make the world a better place. And while you may not necessarily save the world, you have saved a family and created a new family. You made me an aunt, my brother, a father, my sister-in-law, a mom, and my parents, grandparents. From this day forth, you will be my strength on the tough days, you will be my light in the deepest darkness, you are my wish for a better day. You are a lucky baby. You have been born into a multicultural family. You will be fluent in both Spanish and English. You will have many cousins to play with and learn from. Most of them will be from your mother’s side. Your father has a very small family, but we have just as much love for you as the rest of your family. My dearest Liam, you need to know that the world we live in is not an easy one. You will experience a lot in your life. You will learn a lot, and it won’t ever get easier. But you will always prevail and you will become strong. Liam, I can’t say that you won’t ever have problems or experience adversity, because you will, but you will have the love, support and confidence to triumph. Life really is a beautiful thing. Liam, you have given so much to this family in just the few short days you have been with us. Your family has experienced some very tough hardships and sometimes it’s difficult to even get out of bed, but just knowing you exist makes every day brighter. I can’t wait to hold you, and love you, and teach you. I will always be here for you, as will the rest of the family. Thank you for being with us, and thank you for making me an aunt. I love you.